Prior to this review, my personal experience with MSD products has been good. I've used its distributors, CD ignitions, coils, caps, rotors and plug wires in my '71 Big-Block hot rod since I built the car for Vette Magazine back in the 90s. The '95 ZR1 I once owned had MSD coils and wires. My other two Vettes use MSD Super Conductor plug wires. In 30 or so years of using MSD stuff, I've only had one problem and it was self-inflicted. A long time ago, I burned up a 6A CD ignition by, in a monumental lapse of attention, reversing the power connections. Nevertheless, because of an inordinate amount of displeasure with MSD coils for Gen 3 and Gen 4 V8s being expressed on the Internet, up until 2014, I did not consider using them on my C4 and C6. Then, in January of that year, in an exchange of emails I had with Todd Ryden, a technical writer colleague who specializes in ignition subjects, I learned the reputation of the original MSD coils for LS-series engines were tainted by problems the company had with its first two suppliers. The first MSD LS coils were designed in-house, but their manufacturing was out-sourced to an American company specializing in ignition parts. It turned out that this supplier was not only difficult to work with, but it, also, could not meet quality goals MSD specified. Finally, unable to make progress with that supplier, MSD took its coil business to a second domestic manufacturer and, at first, the situation improved, but then, the first supplier bought the second supplier. Awkward! With the memory of MSD cutting ties still a sore spot, friction, again, developed between MSD and its supplier and quality once again suffered. In the field, MSD's ordinarily good name was dragged though the mud of angry Internet forum posts maligning the reliability/durability of its coils for LS-series engines. Needless to say, MSD had a problem on its hands so, in mid-2011, it pulled the plug on the entire LS coil line, then went back to the drawing board. It redesigned the product and went looking for its third new supplier. This time, MSD picked a manufacturer in China. Ok–I know some leery of parts from sources in Asia, but the fact is, more Corvette parts than you think are sourced there. Whether it's the USA, Germany, Japan or, well–China–there are good suppliers and crappy ones. MSD picked one of the top makers of ignition parts in Asia–one that even supplies some American OEs. After learning MSD's Coils had been redesigned and were being made by a new supplier, recalling my past good experiences with other MSD high-performance ignition parts and knowing it was unlikely that MSD would purposely continue to market a bad product–that's not what manufacturers do if they want to stay in business over the long haul–I agreed to test some of them. I installed a set "Pro Power" coils for Gen 4 Small-Block V8s in Corvettes (LS2, LS3, LS7 and LS9). I installed them on the 600-hp, modified LS7 in the CAC's 2012 ZO6. The specific coil we have been using is available individually (PN 8287) or in sets of eight (PN 82878). MSD Pro Power coils are unique in that they are "multiple sparking" up to about 3000-RPM. Similar in concept to the company's "multiple spark discharge" (now you know from where "MSD" comes) CD ignition amplifiers, these coils actually spark several times as the engine runs at low-end and low-mid-range RPM. The advantage of multiple sparks can be improved idle stability and low speed operation of engines having radical aftermarket cams or even LS7s with stock cams. 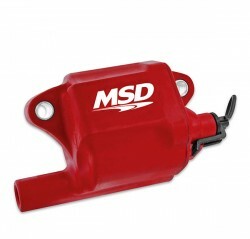 How does MSD accomplish a multiple sparking, inductive ignition coil? The specifics are proprietary. All we know is that, inside each coil, is a printed circuit board which contains the necessary electronics to generate multiple sparks. This coil's maximum potential is 40,000 volts and they have a peak current output of 124-milliamps. For comparison, the stock GM coil used on a Gen 4 in a Corvette can put out 38,000V and a peak current of 108-mA. The CAC has been using these coils with MSD Super Conductor plug wires and Denso Iridium Power IT-22 plugs gapped at .055-in. The more powerful coils and plug wires with lower resistance may allow one to open up the plug gaps by an additional .010-in. To get the best results out of any of the MSD coils for LS engines, the company recommends the 12V power feeds to the coils be at least 16-ga wire which is, nominally, 0.051-in. or 1.29-mm. in diameter. Because most OE coil wiring harnesses have 20-ga. (0.32-in/0.81-mm) power feeds to the coils, in most applications MSD's "LS Coil Upgrade Harness" (PN 88867) is suggested. This wiring harness upgrades the coil power feed wires from 20-ga to 14-ga. The LS Upgrade Harness is "plug-and-play" and connects the stock coil power feeds to a relay. When the ignition is turned on, the relay closes and connects battery voltage to the coils through 14-ga (064-in/1.63-mm) wire. This harness prevents any problems with low voltage to the ignition coils which sometimes cause ECM fault codes to set. The stock Corvette Gen 4 V8 coil is, actually, pretty darn good. Any stock or mildly modified engine will run ok with them. Where MSD Pro Power Coils and their multiple sparking ability might be an advantage is on an engine with an aftermarket cam which is misfiring at idle due to a profile with increased overlap and, for whatever reasons, the user wants the idle to be more smooth. Where these coils really shine is on a modified engine which makes a lot more cylinder pressure such as a high-boost-modified supercharged application or an engine running nitrous oxide injection. In those two situations, the MSD coil's higher output voltage and current could be an advantage. The installation of the coils and the Coil Upgrade Harness is simple, can be accomplished with basic tools and takes a few hours. If there's a downside with an MSD coil installation, if you do it on a stock engine, the Corvette "beauty covers" will not fit over the rocker covers. While that was not an issue with our car, for those having stock rocker covers along with concern for ascetics, it might be a problem. At this writing, we've had a set of MSD Pro Power Coils on the CAC's 2012 ZO6 for five years 50,635-miles and they've been trouble-free in all kinds of use: normal street/highway driving, really hard runs over my favorite twisty roads and a bunch of chassis dyno runs. They work as well today as they did when I installed them back in January of 2014. If you need an aftermarket coil for your Gen 4 V8, put MSD on your list. For more information, see MSD's web site. ...and get in on the action!